In honor of Albert Finney’s death this week, and know I’ve said it before, but Kincade should be a character that’s used in Origins in some way or another. I know there’s legal rights involving his appearance outside of EON, but I feel that like Tiger Tanaka in Felix Leiter, there is possibilities for the character to be used right. I haven’t been paying Origins much attention, and I need to remedy that. But the Oddjob arc? I’m really enjoying it. Bond works well when he has a rival to compete against. Had issue 3 of Oddjob for a week, only just got round to reading. I’m liking the guessing game as to how John Lee connects to the Odd Job we know, and I’m excited to see things with an increased role for Moneypenny, having really enjoyed her one-shot. Is anyone else finding that Greg Pak seems to be far more interested in the cat and mouse chase between Bond and Odd Job than the case they’re supposedly working on? Preview of James Bond 007 #4. Dynamite Entertainment presents a preview of James Bond 007 #4, by writer Greg Pak and artist Stephen Mooney. As Ibrahim Moustafa joins the book. Another interview from James Bond Origin crew. 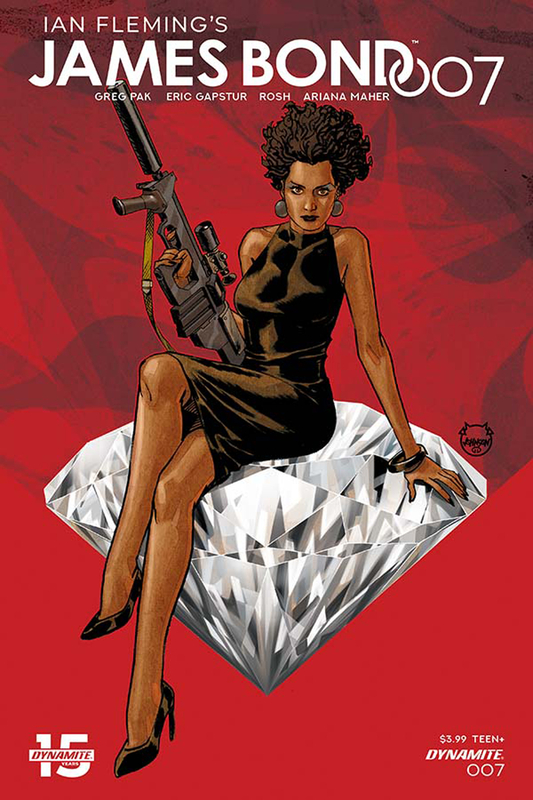 Hopefully in the Dynamite Comics version of LALD, Bond mentions Vesper. It would feel more emotional for the audience to be reminded of her and her relationship to SMERSH. I’m surprised that Fleming never did that in the original LALD book. I don’t see them adding things, more likely removing and bridging, but i’ve been wrong before. I know where you’re coming from but I hope they don’t. Fleming purity is what attracts me to this series. Preview of James Bond #7 and James Bond Origin #9. I binge read all the Origins stories released up until now, and enjoyed them a lot. As a Higson Young Bond fan this is right up my alley. We never received graphic novel adaptions outside of Silverfin, but I think this is even better. War Bond in new stories with possibly the best art so far in the Bond comic series. The references to Dalton and Lazenby were nice too. "GOLDFINGER": A friendship is finished. The world is in peril. And Goldfinger wants diamonds. The modern Bond epic continues by GREG PAK (Planet Hulk, Firefly) and ERIC GAPSTUR (Batman Beyond, The Flash: Season Zero). @MaxZorin did post this slightly up. Oh wow completely missed that. Didn’t know the Dynamite Comics had been out 4 days ago. Upon remembering the cancelled Jinx spin off film, I think it’s story does deserve to be told. Using Purvis and Wade’s script for the film, as the story, of course. Who better than Dynamite to do it? I know that Jinx was wasn’t a well liked character, but Dynamite has done well with their spin offs. I know that IFP and EON aren’t getting along, but both sides could win with this. It deserves a chance! Definitely, great idea. With a proper script I can easily imagine her being an interesting character. The material is there, that’s why I brought it up. Dynamite has been doing other characters, that’s why I think they should do Jinx. Even involve Halle Berry, with her likeness and a foreword. Thanks for the support! Don’t want to jinx it, but he did mention James Bond. Announcement on the way? He could just be discussing what it’s like to adapt a 65 year old book. 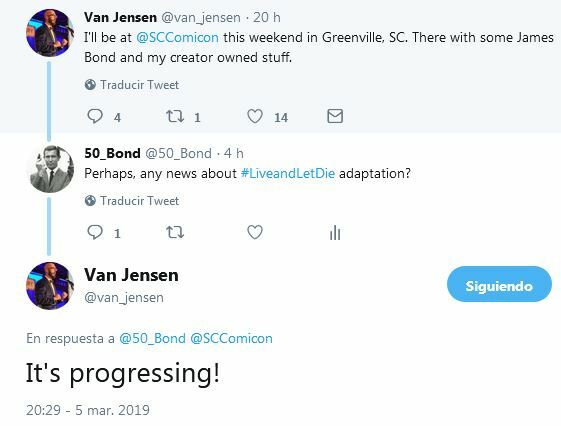 Fingers crossed for info on his Live and Let Die adaptation. Here’s hoping for a possible release date.